Trinity Designs: Bad Blogger - Beautiful Rose! Bad Blogger - Beautiful Rose! Hi there stampers! Yes, I've been a baaad blogger! I was having such a great weekend with my family I forgot to post this card on Mother's Day for you. I had the photo all loaded, but I just didn't come back and add all the blah, blah, blah! I hope you all had a wonderful Mother's Day weekend. The weather couldn't have been more perfect here and we got to sit outside and eat at one of my favorite restaurants. That was a highlight for me! Honestly, it's hard for me to stay inside when the siren song of the sunshine and warm breeze is calling my name. But, duty calls and I'm back in the studio today getting ready for a really fun Card Camp this Saturday! 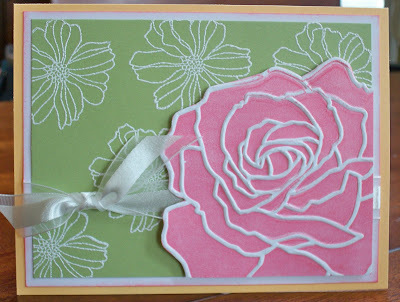 The card I'm posting for you today was one that I initially made for a challenge exchange on a stampin' group I'm involved in and it was going to be my Mother's Day card, but I changed my mind when I created my Blogger's Challenge card last week. The challenge exchange was to use four colors, Apricot Appeal, Certainly Celery and Regal Rose along with a neutral, I chose Whisper White. Cracking open my Fifth Avenue Floral stamp set, I heat embossed the medium flower in White EP onto the Certainly Celery cardstock. This was layered onto the Whisper White cardstock which was edged in Regal Rose ink. I wrapped some of that yummy Whisper White Organza ribbon around these layers and tied a faux bow to finish it off. Those layers were mounted onto an Apricot Appeal folded card base - 5 1/2" x 4 1/4". To create my rose, I took my Manhattan Flower Embossing Folder for the Big Shot and brayered Regal Rose ink inside of it, coating the plastic. I inserted a piece of Whisper White cardstock and ran it through the Big Shot. The brayered ink colored the non-embossed areas of the cardstock and the white flower is actually the raised embossed image. How cool is that?! I'd seen this technique on several other blogs I visit and was anxious to try it on my own. You can be sure that I'll be doing this in card camp with you all! Speaking of, are you registered yet? Just Cards classes are on Tuesday, May 19th at 10 am and 7 pm. AND I've just added a cool new event called Freestyle Stampin' to my calendar this month! Be sure to go to my website calendar and check it out! Now, back to the card - I used my Paper Snips to trim out the large rose and simply mounted it on Stampin' Dimensionals over the Certainly Celery layer. It's actually a pretty easy card, but it sure turned out pretty if I do say so myself! LOL! I hope you like it too - if you do, leave me a comment and tell me so! Your comments always make my day a bit brighter! that's a cute card, and super cool technique, Robin! i wonder if it would work on some of the texturz plates, too??? Blog Awards on My Birthday! It's My Birthday - But YOU Get the Gift! Another Butterfly - I am Obsessed! A Thank You from Andrea! Blogger's Challenge #97 - Sketch Challenge!